Sambaram, chaach, majjige or spiced buttermilk - what is in a name? The drink is truly refreshing. Today was an especially hot day, and when we got back home after the weekly grocery shopping, both of us were tired!!! P loves this drink and loves to have it after a heavy meal. So, I made sambaram. 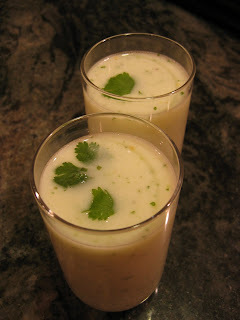 It is very easy to make & it is so refreshing!!! Mince ginger, chili & curry leaves and add to yoghurt - churn well for 1 minute. Add water & salt -churn another minute. It is that easy to make. If you have the traditional wooden / steel churner (mathu), then churn a little longer. I use a hand blender & blend on low speed for a minute.